You Did It, Internet. 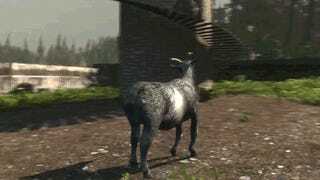 Goat Simulator Is A Real Thing That You Can Buy. Goat Simulator wasn't meant to be a game played by the public—it was just the product of a game jam where the devs were playing around with programming stuff. But when the internet saw footage of the game, almost everyone agreed: we need to have a game that lets us mess everything up as a goat. Because CHAOS REIGNS. Just like I never knew I wanted to be a goat in a game, I also never knew how badly video games need to let me lick things. Especially if licking things lets me swing an axe at people. You can pre-order the game for 9.99 here, which will give you early access to Goat Simulator 3 days before it officially releases on Steam. If you pre-order, you're guaranteed a Steam key. Yay!